Happily the restrictions on getting somewhere fast revolve on three things I’ve talked about on here before: delta-v costs, the exponential fuel requirements of rocket staging, and Hohmann transfer orbits, which all combine into one unholy Megazord of making space travel as complicated as possible. We will start with the simplest scenario of sheer brute force: let us say we have a rocket sitting in Earth orbit with as much fuel as we need it to and we want to use it to take us to a faraway planet/moon/whatever. We figure out how quickly our rocket is going to be going and how long it’s going to take for us to get there, point the rocket at where we think the destination planet is going to be at that date, and start firing the engine. Even discounting gravitational interference from nearby orbiting bodies, doing interplanetary travel like this is going to present us with a couple of problems that should hopefully be fairly obvious if you’ve been paying attention. Accelerating directly against the pull of the Sun’s gravity will require a lot of fuel. If we had infinite fuel this would not be a problem. Infinite fuel would allow us to get around the solar system very very quickly as long as spaceship passengers were willing to put up with the constant g-forces. Unfortunately we live in a world where fuel efficiency is the number one limitation on interplanetary spaceflight. It doesn’t matter how big your engine is or how fast it could potentially make you go if you don’t have the fuel to run it. Any fuel used for maneuvering in between the planets is effectively a very large payload that has to be lifted out of earth’s gravity well. This requires a lot of fuel. And that fuel requires a lot of fuel to lift, and that fuel requires yet more fuel to lift… and I think you get the idea. If you’re launching something from the earth’s surface the fuel requirements increase exponentially with the payload mass, so we want to keep our payload as small as possible. This means drastically, drastically limiting the amount of fuel on our interplanetary spaceship, and for most spacecraft it forces us to get creative when considering how to spend that fuel. Going back to the delta-v chart I talked about last week you’ll remember that it featured “free” delta-v changes in the form of aerobraking. This is a maneuver that uses no fuel but which nevertheless changes the velocity of the spacecraft through interaction with an outside force. In general you want to put as many of these free maneuvers into your flight plan as you can in order to conserve as much fuel as possible, and aside from aerobraking there are two things you can do to get free delta-v: gravitational slingshotting and Hohmann transfer orbits. Gravitational slingshotting is easy to sum up in one sentence but hard to describe in useful detail. As a spacecraft passes close by to a planet it passes around the rim of that planet’s gravity well, and as it does so it trades gravitational potential energy to the planet in exchange for kinetic energy (or velocity). The spacecraft speeds up as a result; however, its direction of travel also changes as its trajectory is altered by the planet’s gravity. Do it right and you can end up with something like this. 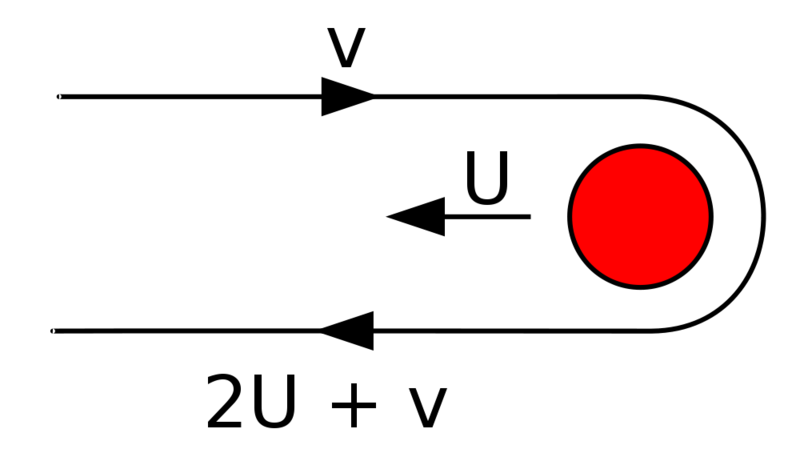 In this diagram the spacecraft is approaching the booster planet with velocity v. The planet is moving in the opposite direction with velocity U. This means the total velocity of the spacecraft relative to the planet is U + v. The key to gravitational slingshotting is this: after completing the slingshot maneuver the velocity of the spacecraft relative to the planet will still be U + v. However, its direction of travel has changed as it skimmed around the planet’s gravity well and it’s now moving in the same direction as the planet, which is still moving at velocity U. In order to still be moving at U + v relative to the planet, which itself is moving at velocity U, the spacecraft has to be moving at U + U + v, or 2U + v.
By doing this gravitational slingshot the spacecraft has increased its velocity by 2U for free (without burning any fuel), but the slingshot maneuver does have some strings attached; namely that you need a large gravity source somewhere near to the desired trajectory of your spacecraft in order to do it, and planets are curiously uncooperatively in this regard, rarely being in a good enough alignment to make multiple slingshot maneuvers possible without taking the spacecraft a very long way off course. For example, the Voyager missions took advantage of a fortuitous alignment of the outer planets to embark on its famous Grand Tour, doing a slingshot manuever as they encountered each gas giant, but such an alignment of the gas giants is not going to happen again until the 22nd century. The requirement that the slingshot gravity source be moving relative to the destination of the spacecraft (because that 2U of extra speed is picked up as a result of the gravity source’s own motion through space) is also a bit of a kicker since it means we can’t use the Sun for slingshots. The idea is that the elliptical orbit runs off at a tangent from each of the circular orbits. A spacecraft orbiting (for example) the Earth already has a certain amount of orbital velocity, so it only requires a limited burn of the engine in order to bump the spacecraft’s velocity up just slightly and put it onto an elliptical trajectory. 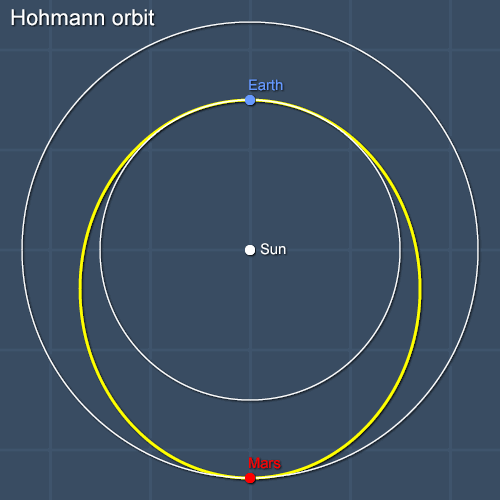 Some time passes – one of the drawbacks of the Hohmann method is that it’s relatively slow, relying on natural Newtonian motion through space rather than rockets or engines – and then, if you’ve planned things right, your spacecraft will eventually reach the destination circular orbit at the same time as the planet you happen to be trying to get to is passing through the area. Because the orbital velocity of planets decreases the further away from the Sun they are the spacecraft then has to make a deceleration burn in order to bleed off some speed and enter a stable orbit around the destination, but after that the job is done. That’s all it takes in an ideal scenario: one brief engine burn at the start of a spacecraft’s journey, and another brief burn at the end of it. Gravity takes care of the rest. As ever with space travel, though, you don’t get anything for free. As already mentioned, the Hohmann may be very economical in terms of fuel but it is also rather slow when compared to other more energetic methods of space travel. Additionally you have to arrange things so that the destination planet shows up at the same time and place as your spacecraft does; given the alignments of the planets and the different speeds at which they orbit the Sun this means you have to launch the spacecraft from Earth orbit at a very particular point in time, which in turn gives rise to the charming concept of the spacecraft launch window. In the case of planets this is the same as the synodic period, so in the case of Mars there will be one launch window every two years, Venus has one every 1.6 years, and so on. I may as well end on an anecdote. Most spacecraft heading towards the outer solar system use something similar to a Centaur rocket booster to attempt a direct trajectory approach and get there relatively quickly. The Galileo probe was scheduled to be launched on a Centaur deployed from the Space Shuttle in the late 80s. Unfortunately for Galileo the Challenger disaster happened and not only did the mission get pushed back, but Centaur boosters were banned from being carried on the Shuttle. Without the Centaur the scientists behind Galileo had to display a significant amount of ingenuity to get the probe up to the required velocity to send it out to its destination, Jupiter. 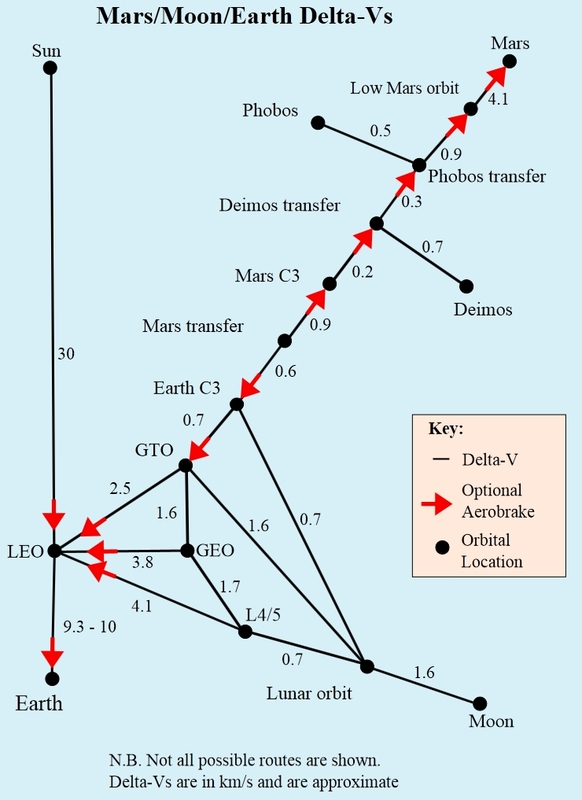 This is Galileo’s final trajectory. 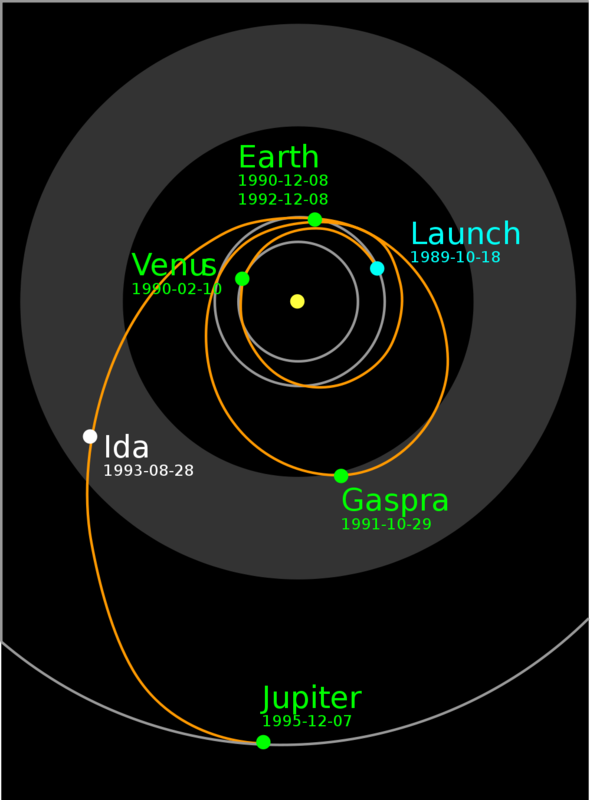 It features a Venus gravity assist, an Earth gravity assist, a visit to an asteroid called Gaspra, a return to Earth for a second gravity assist, and then finally – after three years of travel that brought it back to where it started – it was ready to start the trip out to Jupiter. It still took four years. New Horizons used a Centaur booster and a Star-48B engine in an unusual three-stage configuration of the Atlas rocket to get to Jupiter in just nine months. So while the methods of interplanetary travel I have described here are very energy and fuel-efficient, they are very definitely not fast. Pretty exciting putting all the bits together. Starts making ever more sense.